"The line was here, in Zelenj Jadar. This was the Unprofor checkpoint, the Serbs were in front and we were 20 metres down. If you go straight you get to the Drina, right you go to Milići. Srebrenica is behind us. If this line broke, the Chetniks entered the city". I drive with Muhamed along the road used by Mladić's army in July '95. When the war came to Srebrenica, Muhamed was not even ten. His village overlooks mount Tara, and was bombed directly from the Serbian side, across the river. At every turn of the road he stops, and explains what happened in that place. "Up there, it is still full of mines. Here, in Kralja Voda, Goran Zekić's paramilitaries set everything on fire straight away, in '92. You can still see the remains of their work. Beyond the former separation zone, on the right, there are the graves of the soldiers. The trenches were up there. Serbia is one kilometre in front of us". Twenty years have passed. It doesn't seem a long time, as Muhamed shows me the places where he lived as a child. A genocide does not end when the killings stop. It goes on, when bones keep on coming out of the ground and nasty questions keep on haunting survivors. "See that hill? From there it is easy to stop the tanks. Why didn't they? If you block the first one, the road is closed. But the Dutch, instead of defending the city, prevented us from shooting. They were accomplices in the fall of Srebrenica, and in the genocide". Recent revelations of The Observer and Argos TV channel show that the responsibilities for what happened in July '95 are not only of the Netherlands. France, Britain, and the United States had already decided not to support with air strikes the Dutch troops on the ground, leaving the enclave defenceless. Yet another chapter, in a long list of responsibilities, has recently emerged. The Bosniak (Bosnian Muslim) one. Why was their command not there in those crucial days? Why was a counter-offensive not authorised, at least to help those who were trying to escape through the mountains? A recent interview of Bosnian Dnevni Avaz to Naser Orić, commander of the town's defence forces, has brought up also these questions. Ćamil Duraković, the young mayor of Srebrenica, welcomes me to the Town Hall. He was also little more than a child, when the city fell. "I was 16, and found myself separated from my family. I had to decide for myself whether to surrender in Potočari, at the United Nations compound, or try to reach Tuzla through the mountains. I chose the mountains. We formed a column in Šušnjari, to begin the march. There were about 13,000 of us – I'm one of the few who survived". The mayor says he remembers "every detail" of that march, 7 days and 6 nights towards Tuzla, but prefers to cut it short. "Every day there were ambushes, attacks, shootings. It was hell". After the war, Duraković fled to the United States, where he got his degree in economics. After, he decided to return to his country, "because this is my country, and I want to help to improve the situation". Last fall, at the end of an intense election campaign focused on the attribution of the right of residence (and vote) to the Bosnian Muslims who were expelled in '95, he became mayor. "After a genocide, can you have free elections? They killed over 8,000 people and then held democratic elections. Is this democracy?" Duraković, supported by a Bosnian association, the 1 March Coalition, tried to persuade as many Bosniaks, among those who no longer live in Srebrenica, to re-register here. "It was a head to head race. Today 50% of the population is Serbian and 50% Bosnian Muslim. I eventually won by a few hundred votes". 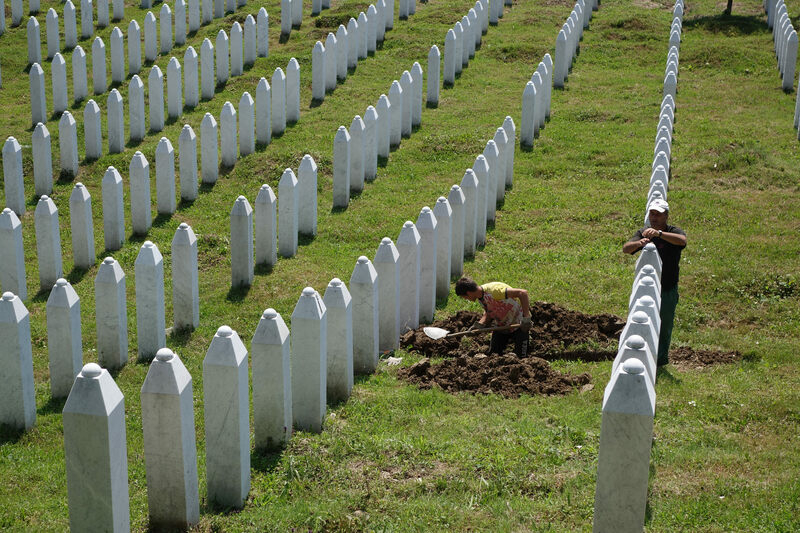 Before the war, in Srebrenica lived about 28,000 Bosniaks and 9,000 Serbs. Ten years ago, in 2005, I asked mayor Abdurahman Malkić how many inhabitants the municipality had. "About ten thousand", he replied. Ten years later, I ask Duraković the same question. "Seven thousand". The return process did not work. Instead of growing, the population keeps declining. According to Duraković, "the key to return is economic stability. Jobs and growth will get people back. The economy can also help to create links between people, fostering reconciliation. We know how to live together, we only need a stable future from an economic standpoint". It is important to have hope, and the mayor's words are encouraging. But it doesn't look easy. We are in Republika Srpska, in a town led by a Bosniak mayor. The policy framework is complicated, does not facilitate investments, and the country's overall situation is not rosy. Few kilometres separate Srebrenica from Potočari, where the Genocide Memorial is. On July 11th, '95, thousands of Bosnian Muslims, terrified after the Serbian troops had entered the city, had sought refuge here, in the UN headquarters. Instead, the Dutch troops handed over the civilians to the Serbs. This is the fault of the Netherlands, not the fact that they did not defend a defenceless enclave. It was acknowledged by the Netherlands' judiciary itself, after a lawsuit filed by one of the survivors, Hasan Nuhanović, a man who for years has been fighting alone for the truth about those events. His mother, father and brother had taken refuge in the base where he was working as an interpreter. The UN soldiers, instead, sent them out. Hasan found them only years later, in the mass graves. "The idea of ​​creating a memorial here came up in '98", says Amra Begić, one of the directors of the structure. "The Mothers decided to bury their sons all together, in the place where they had seen them for the last time. Works began in 2001, and today 6,241 people are buried here". I ask how many visitors come each year. "On average, 130,000 visitors, mostly from the Federation of Bosnia and Herzegovina, especially high school and university students. Then there are individuals and groups who come from all over the world, many from Turkey, but also from Germany and Italy, especially the scouts". These are impressive figures for a country with less than four million inhabitants. I make up that almost all Bosnian Muslims have come, at least once. The construction of national identity, after the war, comes with the acknowledgment of being a victim. I would have been more reassured to know about 100,000 visitors each year from Republika Srpska. But this is not the Germany of Willy Brandt. Here, victimhood lives side by side with denial. A lethal mixture. Better not to be too pessimistic, however. Of course, there will be no more war. "Never again". I spend the last part of the day with Muhamed. He fled from Srebrenica with his mother during the war and wandered for years as a refugee. Eventually, like the mayor and few others, he decided to go back. "Return brings very strong emotions. I had lived here only 11 years, and then 15 between Tuzla and Sarajevo. Those 15 years, however, are nothing compared to the 11 years I spent in the place where I was born. I came back to the source of all my memories. Everywhere there is something, an episode, a story that belongs to me. This is one of the greatest riches that I have today. It's a part of me, as my hands are". Shortly after returning to Srebrenica, Muhamed found a tape he did not know of. It was the recording of an old radio broadcast, "Selo Veselo" (Happy Village). His father, the director of a middle school, was in it. When Muhamed had fled from Srebrenica, in a convoy with his mother and sister, he had to stay behind. "I remember my father, his face is something I will never forget. But a voice is harder to remember. If you do not hear a voice for a long time, it gets lost. You can't understand what it meant to me, finding a treasure like this. Had I gone to live anywhere else, it would not have happened". I once asked Bosnian writer and poet Abdulah Sidran to help me understand something about the Drina, about this region, its people and history. He warned me that the people of the Drina are attached to their land in a way that cannot be explained, or understood. Something like a pathology, the river is a part of their mind – he said. Wherever they ended up as refugees, in the four corners of the world, they keep on dreaming about the river, the Drina. At the end of the day, Muhamed brings me to lake Perućac, where some years ago the dead bodies of Muslims thrown into the Drina in Višegrad, a few kilometers upstream, surfaced. He explains that before the war, in the villages on the Bosnian side where his father taught, there were so many children that the schools were not enough, they had to do double shifts. It is evening already, I have to get back to Sarajevo. I came here for the first time in the late '90s. Since then I returned many times, in the naïve belief that, in order to understand today's Europe, I had to understand what happened in this remote Eastern Bosnia, where Serbs and Muslims lived side by side for centuries. Tomorrow, foreign ministers, presidents, and thousands of people will be coming here to honour the victims of July '95. I look at the schools that twenty years ago were too small to keep all children. The empty buildings, in empty villages, echo "like a shoe with no foot, a suit with no man ". After the war there were refugees, then someone began to return, and it seemed as if the houses were about to be filled again. Then it all stopped. Of 40,000 inhabitants, today there are only 7,000 left. Maybe. There is no one here. Neither Serbs nor Muslims. The dead outnumber the living. Those thousands of men and boys, in Potočari, sleeping on the hill.